In my last missive, Lyonizing Word: Editing by Computer, I discussed some of the grammar checkers that seem to be popping up like mushrooms online. But I neglected to discuss Microsoft Word’s built-in grammar checker. Is it any good? And might it be of use to professional editors? Let’s find out. The double blue underlines indicate possible problems with grammar, spacing, or punctuation. The wavy red underlines indicate possible spelling errors. For all of these I say “possible” because Word may get things wrong; you can’t blindly accept its recommendations. But they do give you something to consider, including things you might otherwise overlook. 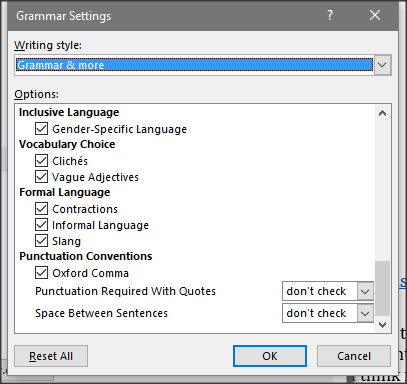 The grammar checker also flags many things that editors would be better off fixing with Word’s Find and Replace feature or FileCleaner in Editor’s ToolKit Plus 2014. If something can be fixed automatically, there’s no need to have Word check it and flag it; to do so would just mean more work, because you’d have to consider and manually change each flagged item. Examples include checking for punctuation marks preceded by a space, opening parentheses followed by a space, and double spaces between words and sentences. All such corrections can and should be automated. Example: They don’t have a discussion board, the website isn’t big enough for one yet. Correction: They don’t have a discussion board; the website isn’t big enough for one yet. Example: If you’re like me you’ve already seen this movie. Correction: If you’re like me, you’ve already seen this movie. Targets a missing comma after short introductory phrases such as “however” or “for example” before an independent clause that follows. Example: First of all we must make sure the power is off. Correction: First of all, we must make sure the power is off . Targets complex and abstract words, and suggests using a simpler word to present a clear message and a more approachable tone. Example: The magnitude of the problem is far beyond the scope of humanitarian aid. Correction: The size of the problem is far beyond the scope of humanitarian aid. Targets jargon, technical terminology, or abbreviations that may confuse some readers. Example: The company hired a well-known headhunting firm. Correction: The company hired a well-known recruiting firm. Targets phrases relying on nouns that need extra words to introduce them and suggests using a single verb instead of nouns. Example: The trade union is holding negotiations with the employers. Correction: The trade union is negotiating with the employers. Targets redundant and needless words. Example: Her backpack was large in size. Correction: Her backpack was large. Targets words that express uncertainty or lessen the impact of a statement. Example: They largely decorated the kitchen with old bottles. Correction: They decorated the kitchen with old bottles. Targets gendered language which may be perceived as excluding, dismissive, or stereotyping. Example: We need more policemen to maintain public safety. Correction: We need more police officers to maintain public safety. Targets overused and predictable words or phrases and suggests to replace them with an alternative phrase. Example: Institutions seem caught between a rock and a hard place. Correction: Institutions seem caught in a difficult situation. Targets contractions (e.g., let’s, we’ve, can’t), which should be avoided in formal writing. Example: The animal won’t be authorized to be out of the bag during the flight. Correction: The animal will not be authorized to be out of the bag during the flight. Targets informal words and phrases that are more appropriate for familiar, conversational settings. Example: Our lounge includes comfy massage chairs. Correction: Our lounge includes comfortable massage chairs. Targets regional expressions or slang terms that may not be understood by a general audience and should be avoided in formal writing. Example: My cat barfed all over my homework last night. Targets a missing comma after the second-to-last item in a list. Example: I enjoy apples, pears and oranges. Correction: I enjoy apples, pears, and oranges. Many more options are available; you can see the whole list at Microsoft’s website. When you’re finished, click the “OK” button. Those are of limited help, although Microsoft claims to be working on new styles to be added in future updates. In the meantime, I’d recommend selecting only the grammar options that you think might really be of help. Here, less is definitely more. If, however, the idea of using a more advanced grammar checker appeals to you, you might try Grammarly’s free add-in for Microsoft Word. That line defines (“dimensions”) a variable called “GrammarCheck.” We’ll use that variable to hold the value of the current setting (grammar checker on or off). If the value of GrammarCheck is “False” (that is, the grammar checker is off), we turn it on by setting it to “True.” We also make sure grammar errors are showing in the active document. Otherwise (“Else”), if the grammar checker is on, we turn it off by setting it to “False.” We also turn off the display of grammar errors. Place your cursor in your document. 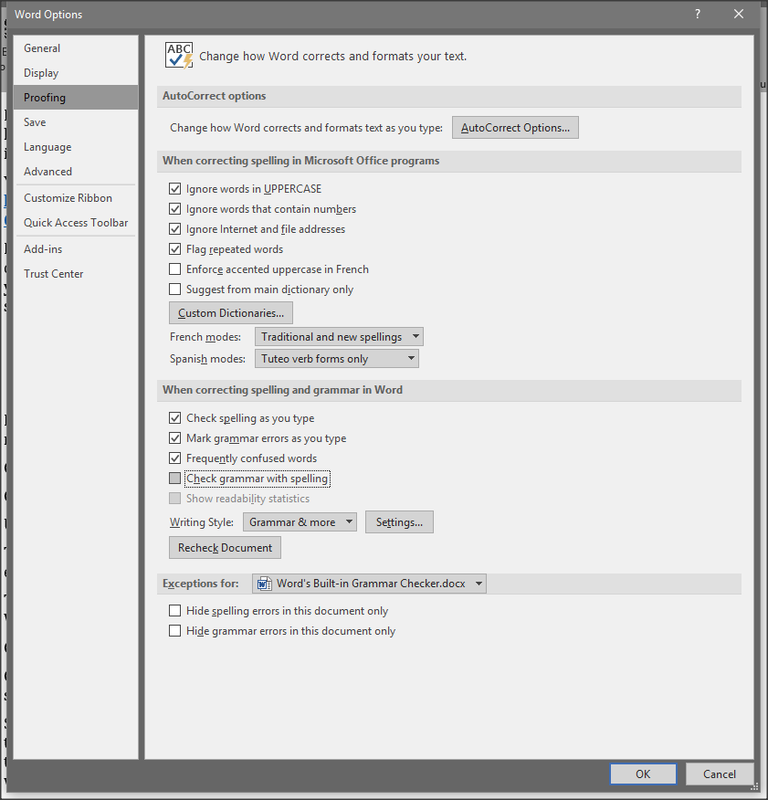 Do you use Word’s grammar checker? If so, what options do you find most useful? I’d love to hear about your experiences with this. I tinker with grammar settings to help find the errors I miss with my eye and can’t catch using other tools. The setting (or macro or software package) that still eludes me will flag bloopers like “he went the into room.” If anyone knows how to catch that one, let us know! It used to be that writing style and form were purely at the disposal of the individual. Now corporate mono-culture is slowly seeping into typos and correcting them to a standardized font. No longer will conscious humans be making the decision to leave an personalized word in place of conformist legal-speak. Now all writing will be made by the unconscious; a single mind, formatting 0s and 1s to match an inhuman definition of Clarity and Consciousness dictated by Lord Gates.